r5065 Factories demands neither pax nor mail. Topic: r5065 Factories demands neither pax nor mail. Here there is. Factories stopped demand any pax/mail in either savegames or new maps. 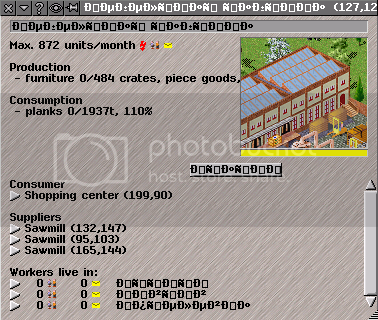 I,ve enabled a "factory_enforce_demand" and set "factory_arrival_periods" to 4 and started a new game. The result of these steps is on the screenshot. P.S. I usually use a cyrillic charset (cyrillic names) and a Russian translation. And when I've switched a language to English, cyrillic name becomes unreadable (see the screenshot). Is this a bug too? Re: r5065 Factories demands neither pax nor mail. To no passengers and post demand: it is strange but not bug-like. Mostly if any town is very small, no passengers and post may be needed. But that no one of those three towns give passengers and post is very strange. So for this case I have to have one minor addictional question: is this similar for all factories you have in that game? To conflict between English and Russian alphabets: it is right because game does not use UTF-8 fonts - but fonts special for each alphabet - and so font for English language does not know letters of Russian language. If the factory does not demand workers in the beginning, it might be correct. What pak exactly? ... I have this situation in current game too (and I play with 5052) - with few factories. Some ones (mostly source factories) show zero ?demand - and some show any number. So, I think that it may not be bug - but case of wrong translation or so. But it is quite strange - because at first one factory showed demand of people and post ... and few whiles ago this demand ended. Some strings are only passed through the translator upon opening of the dialog. Changing the language with dialog open results in what you got. Close/Reopen the dialog should fix it. Edit: didn't read close enough. names.. First reply is correct, english (latin) font can't display those characters. Current pak128 svn source does indeed have all *_demand=0. Which does exactly as stated, 0 demand. The _demand settings replace the pax_level setting for proportioning the distribution of the generated passengers. i.e. Leave out the _demand settings (or set = 65535) and it falls back to the old pax_level routine for compatability with old paks. If _demand is specified, then pax_level is ignored in the new algorithm. Value is the total number of passengers per 18bit month that will be sent to the factory from all attached cities. (Not strictly true as there is some oversupply, but a good enough explanation for pak creation purposes...). Delivering enough passengers to meet the demand is what causes full boost. If a player only delivers 1/2 the demand, then only 1/2 the boost is in effect. Even with 0 passenger supply, the factory will still produce at its base production rate. Boost is always an increase to that. Ok, thanks for all explanations!